Grand Rapids’ forward Nate Mondry was using his stick as if it were a pitchfork. 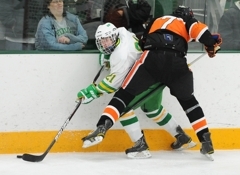 At the business end of Mondry’s determined efforts was Edina goalie Willie Benjamin, who was on top of the puck and in the process of being well … “pitchforked” into the goal. Somehow, in all the excitement, Benjamin lost his facemask. Goalmouth scrums, flying facemasks, sticks doubling as farm implements … these sorts of things have been happening for years when longtime state powerhouses Grand Rapids and Edina square off. When these teams clash the rare becomes routine. Consider, for example, the second-period sequence in which both Benjamin and Hornets freshman defenseman Jack Walker lost their sticks during a Grand Rapids power play. Normally, when a goaltender loses his stick the protocol is for a defenseman to give up his. The protocol in this case? Well, there is no game-planning such a bizarre situation. 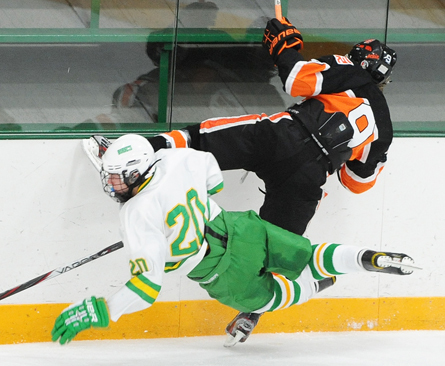 "Your goaltender loses his stick, one of your defensemen loses his stick ,” Edina coach Curt Giles said. “You don’t want the other defenseman to give his stick away, you are really in trouble then. Although Grand Rapids buzzed Edina for the better part of a minute, things worked out just fine for the Hornets, who finally managed to send the puck to the other end and kill the penalty. Moments later, junior Bo Brauer came flying onto the ice and into the Grand Rapids zone, where he spotted an opening and threaded the puck through it. Brauer’s goal sparked the Hornets to an eventual 4-3 victory over Grand Rapids on Thursday, Dec. 8, in an Edina Holiday Classic matchup of teams who have not only rich histories – Grand Rapids has three state titles; Edina has seven – but currently are ranked among the state’s top 10 in Class 2A. 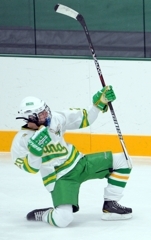 Brauer’s goal put Edina ahead 2-1 late in the second period. Brauer scored again in the third, as did teammate Andy Jordahl, as the Hornets took a 4-1 lead. Grand Rapids is No. 6 in the state rankings. Edina is No. 9. Both teams have 5-1-0 records. There isn’t much separating them. A bounce here, a well-timed save there, special teams efficiency – even the slightest advantage could determine the winner. Yes, the teams combined for 48 minutes in penalties, but there clearly was a mutual respect amidst all the angst. “They didn’t give up,” Brauer said. “They were fighting hard and coming back strong. They are a great team. Like (Giles) said, they were big and strong. Great might not be the word Benjamin would use for the final, frantic minutes played mostly in the Edina end. But he survived, just as he had all game. 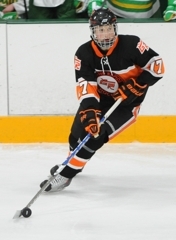 Grand Rapids junior defenseman Jake Bischoff is more than a power-play specialist. The University of Minnesota recruit plays an all-around superb game. Put Bischoff on the power play, though, and you’ve got something, for lack of a better word, special. Bischoff suffered a head injury in a Dec. 6 victory over Virginia and hasn’t been in the Thunderhawks’ lineup since. Grand Rapids coach Bruce LaRoque said Bischoff has been cleared for light skating but won’t be back in the lineup until after the Edina Holiday Classic. “He’ll be back, hopefully, after Christmas for our tournament at home,” LaRoque said. “He got dinged in the head so obviously were being careful, trying to bring him back slow, when he’s ready. 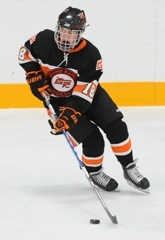 Bischoff scored 29 points (5 goals, 24 assists) in 27 games last season. He had four assists this season before being injured. "Sometimes it’s a blessing in disguise," LaRoque said about Bischoff's injury. "Other guys have to step up for a while and get into new roles to play. Maybe it makes us deeper at the end. "Certaily we miss him, he’s a very good player and he can run the top of the power play exceptionally well." Junior forward Bo Brauer scored twice, including the game winner on a power play in the third period, and No. 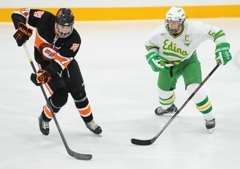 9-ranked Edina held off a late comeback attempt to beat No. 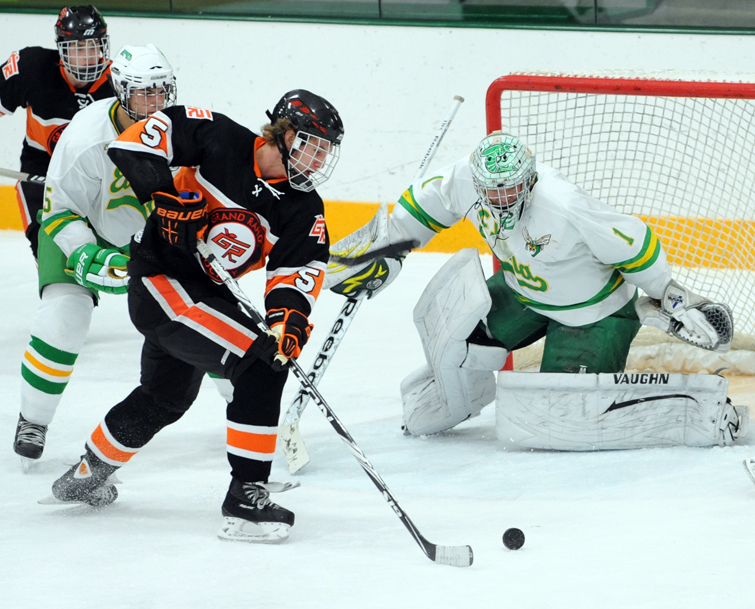 6 Grand Rapids 4-3 on Thursday, Dec. 8, in the opening round of the Edina Holiday Classic at Braemar Arena. Brauer’s power-play goal gave the Hornets (5-1-0) a 4-1 lead with 10 minutes, 41 seconds remaining, but the previously unbeaten Thunderhawks rallied with goals from Nick Koerbitz and Travis Underwood in the final 5:21. Underwood’s goal, which came a after nifty inside-outside move on an Edina defenseman gave him an opening to shoot from the left face-off circle, pulled Grand Rapids to within one with 1:38 remaining. The Thunderhawks (5-1-0) pulled goaltender Patrick Flaherty in the final minute and applied heavy pressure in the Edina end. But the Hornets managed to keep most of the shots from the outside, and junior goaltender Willie Benjamin smothered the ones that did get through. 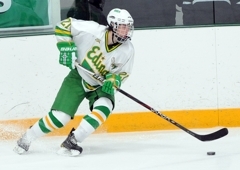 Dylan Malmqust and Andy Jordahl also scored for Edina. Nate Mondry scored the first Grand Rapids goal. Benjamin made 23 saves for the Hornets. 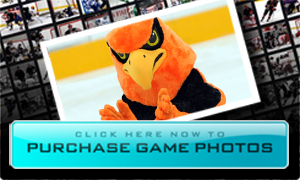 Flaherty finished with 36 saves for Grand Rapids, which played without star defenseman Jake Bischoff, a University of Minnesota recruit who is recovering from a head injury. 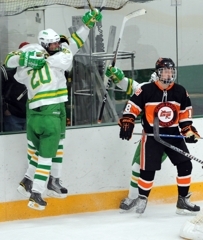 Edina went 2-for-5 on the power play while Grand Rapids was 1-for-6. The teams combined for 48 minutes in penalties. 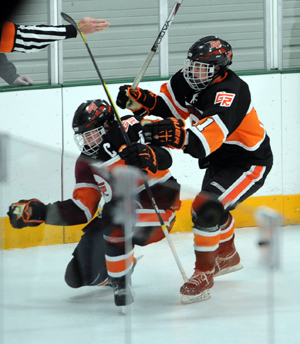 The junior forward’s second-period goal put the Hornets ahead 2-1 and came seconds after the Hornets killed a penalty, escaping a flurry of close-range Thunderhawks chances. Brauer also scored what proved to be the winning goal in the third, alertly swatting a rebound into the goal. 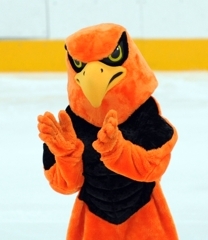 The senior forward scored the only goal of the first period and assisted on Travis Underwood’s goal that pulled the Thunderhawks to within 4-3 with less than 2 minutes remaining. Mondry boosted his season point total to a team-best 14. One of two freshmen on the Hornets’ roster, Malmquist had a goal and two assists as he extended his goal-scoring streak to four games. Malmquist has scored at least a point in five of the Hornets’ six games, totaling nine to rank second on the team.